Just north of downtown Los Angeles, Hollywood is the hub of the film industry and offers families a variety of celebrity-themed fun for all ages! 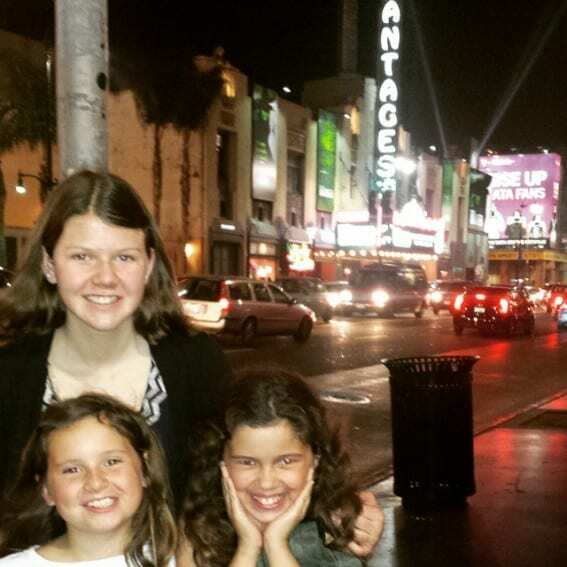 To help discover the best things for families to do in Tinseltown, explore our favorite things to do in Hollywood with Kids. Studio tours are a great way to get a peek behind the curtain of fame! Many of the large studios offer tours for the family, however it is important to check age restrictions before booking. Paramount’s Behind the Scene’s Experience delivers 100 years of moviemaking history; the active studio tour begins at the iconic Paramount gate and takes you inside active sets along the way. The Warner Bros. Studio Tour is perfect for superhero fans with exhibits on DC Heroes, Batman, and Harry Potter (even though they may all exist in different universes!) in addition to tours of the working lot. To most kids, there is no bigger star or iconic image than Mickey Mouse, so why not see where he comes to life?! The only way to book an exclusive tour of the Disney Animation Studio is directly through Adventures by Disney, so plan ahead to combine this with a Disneyland trip. Families should also check out the Studio Tour at Universal Studios (included with general admission to the theme park) to see an inside look at past film scenes and a few live stages. The tour also includes thrilling rides and adventures, and is hilariously narrated by Jimmy Fallon. Check out why a California movie house tour is great for families. Don’t Miss: Check out all the family-friendly details and plan your visit to The Wizarding World of Harry Potter. Looking to catch a glimpse of a star? 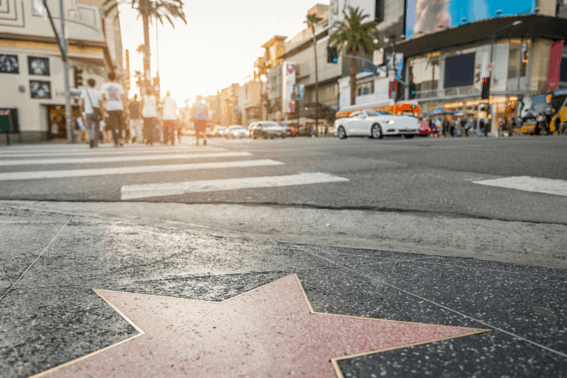 It may be incredibly touristy and overcrowded, but a ride on-board the Hollywood Bus Tour or a trip to the Walk of Fame provides a fun opportunity for older kids and teens. If you opt for a bus tour, you’ll drive around the gorgeous homes of Hollywood and Beverly Hills. Even if you don’t see a celebrity, your family will at least enjoy posh neighborhoods. 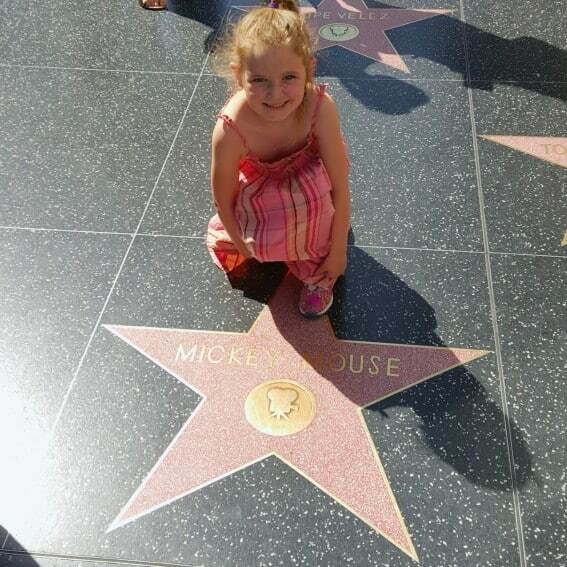 The Walk of Fame is fun for families; children will get to hunt down their favorite celebrities and pose with their star. But be prepared. The main portions of this walk (on Hollywood Boulevard near Highland Ave.) are highly visited, very crowded, and full of numerous panhandlers. The footprints in front of TCL Chinese Theater are another great option for fan frenzy. If you come up short while celebrity-spotting, there is no better way to ensure you get a picture with your favorite star than the Madame Tussauds Wax Museum where you can pose with all your favorite red carpet stars leaving your friends wondering how you managed to meet the world’s biggest celebs on your visit to Hollywood. Don’t Miss: To see stars of the celestial variety, don’t miss a visit to nearby Griffith Park’s Observatory offering free star parties, free admission, and free use of their powerful telescopes nightly. Located just a few miles east of Hollywood, Griffith Park offers a ton of family fun including the Los Angeles Zoo, the carousel that inspired Disneyland, and museums- you can even put yourself in a movie with the aid of a green screen at the Autry Western Heritage Museum. Live shows and performances abound in Hollywood. For exceptional, live, Broadway-style entertainment, don’t miss a show at the historic Pantages Theatre on Hollywood Boulevard. Built in the 1930s, the theatre still boasts its stunning art-decco inspired design and decorations that have to be seen. Same-day lottery tickets are available to many shows; if you get lucky, you’ll score superb seats at a steal. Other great Hollywood venues include the Dolby Theater (take a tour of this home of the Oscars), the Hollywood Bowl (which features a museum of artifacts from its history in addition to live shows and the ability to picnic onsite), and the TCL Chinese Theater, where you can see current cinema offerings and many premieres. You won’t want to miss a Disney film at the historic El Capitan Theater across from the Hollywood & Highland shopping complex. With live pre-movie shows & performances included with movie tickets, its famous organ performances, art-decco inspired design, and a Ghirardelli Chocolate Fountain shop with Disney merchandise out front, seeing a movie here is a premiere event! Don’t Miss: Older kids (typically 10 and up) can get tickets to see a live taping of a show. Tickets can be hard to come by, typically must be reserved well in advance, and are often over-booked to ensure a full audience, but with a bit of flexibility, you can enjoy a live taping of game shows, Disney channel sitcoms, and live talent and dance competitions. Hollywood and shopping go hand in hand! Prepare yourself for some sticker shock at many of these venues, but window shopping is always fun and they make for the best photos! Begin your shopping experience at the Beverly Hills Sign at the end of Rodeo Drive. The grassy area just west of the sign is a great place to let the small kids get energy out before exploring the stores. 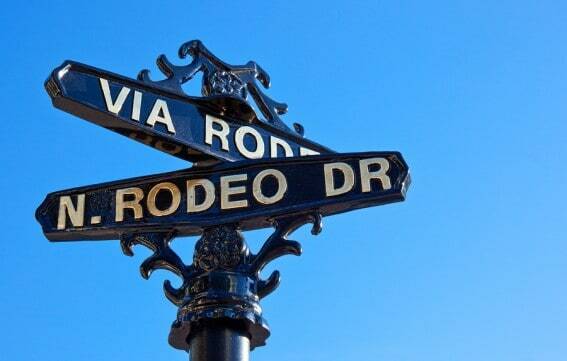 Rodeo is host to all the premium shopping brands, such as Louis Vuitton, Vera Wang, and Prada. Another favorite photo spots is just north of the Tiffany’s building – a set of steep stairs offers a beautiful back drop. If you are looking for a mall in Beverly Hills, the Beverly Center offers family friendly shopping with excellent brands like Fendi and Jimmy Choo along with kid-friendly dining and stores. In the middle of the Hollywood scene you’ll find the Hollywood & Highland Shopping Complex, which also makes for a great parking location for sightseeing, shows, and celebrity hunting – you can even see the famous Hollywood sign from the structure! Reward your well-behaved kiddos with a trip to Sweet, the mall’s massive candy shop full of interactive toys, play things, and of course, loads of candy. Another great option for families looking to shop till they drop is The Grove near La Brea, offering unique stores and kid-friendly dining. Don’t miss the park at the center of the mall that plays host to premier events and live music; your kids will love the musical fountain and babbling brook! Stores like the American Girl Place (plan ahead & bring your doll!) and Barnes and Noble will let kids explore and offer a sense of wonder. 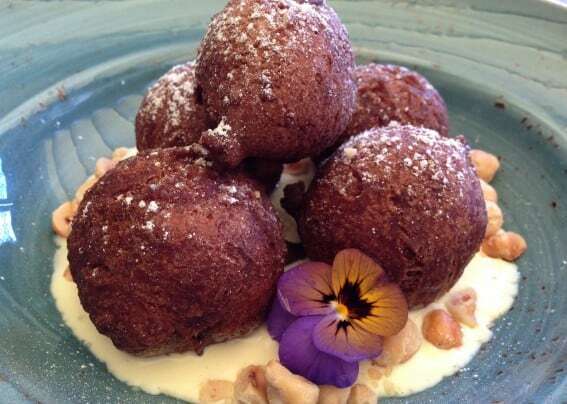 While at The Grove venture next door to the iconic original Farmer’s Market, host to some of the most amazing food! Once you visit you will notice how often this market shows up in movies and television. 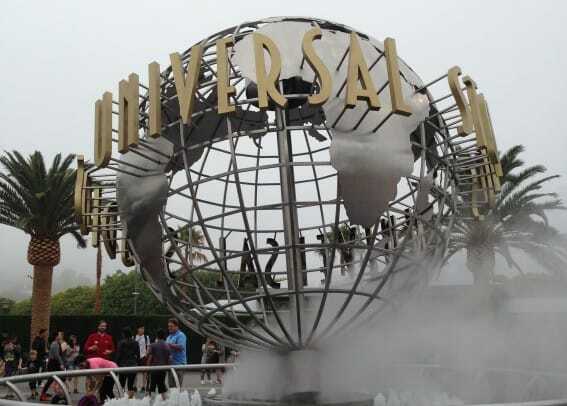 Another fun place to take the family to shop in Hollywood is the Universal City Walk. The shopping center offers store fronts decorated with all the glitz of Hollywood! Stores like It’s Sugar and Crow’s Nest Toys will excite your kids – be prepared for the begging to start! Top off your visit with a meal at the Hard Rock Cafe or Bubba Gumps to round out the experience. Don’t Miss: The American Girl store at the Grove is an experience in and of itself. Bring your own dolls (or purchase while there) to get hairstyles updated at the salon or enjoy a bite to eat in the café. Birthday parties and celebrations held here take the cake! The Hollywood area has endless dining choices. To help guide your family to an enjoyable experience, try one of our Trekaroo-tested and approved restaurants. With nearly 100 years of restaurant history in Hollywood (opened in 1919), Musso & Frank Grill is a must-try when checking out the Hollywood dining theme. It is hard not to feel the old-school Hollywood vibe when sitting in booths previously sat in by Charlie Chaplin, Marilyn Monroe, Jimmy Steward, and so many more. The restaurant serves a fairly sophisticated crowd, so only well-behaved, older kiddos are recommended. Located in West Hollywood, Roku offers an up-scale dining experience that is both fun and interactive for the whole family. Trekaroo recommends you pass by the tabled section full of posh diners & business class to head straight to the Teppanyaki dining room where an experienced chef serves up your food tableside with passion and flare. This isn’t Benihana, and your taste buds will be grateful (think Nova Scotia Lobster Tail with uni butter and Filet Mignon with foie gras and truffles instead). Your kids will be entertained throughout your paced-out meal, and the kid-friendly menu was a hit with every member of my family. The Rooftop Grill at The Montage in Beverly Hills, offers delicious classics turned gourmet. The Baked Salmon is especially delicious! The Rooftop is family-friendly but the Montage has a kids program for lunch at the Paintbox (onsite kid’s club) – kids can enjoy lunch, story time, and crafts. Take advantage of the Paintbox and enjoy a bit of grownup relaxation! The Front Yard is an oasis set in Hollywood. It is a regular stop for locals and those in the film industry. The Front Yard has several dining options: outdoor patio, main dining room, bar, and private rooms. The restaurant is close enough to stop by after a day at Universal Studios and is a great escape from the hustle of the park. Disney’s Soda Fountain and Studio Store is a fun stop for family while visiting Hollywood Blvd. The Disney Soda Fountain offers a full menu including Ghirardelli desserts. Kids will love the Disney-themed room and shopping throughout the store. Parents will enjoy the excellent standard of dining that accompanies the Disney name. It’s been some years since the cupcake craze began, but it is still a hit with kids. See where the phenomenon began by visiting Sprinkles Cupcakes in either its Beverly Hills original store (with thrilling cupcake ATM machine!) or its smaller stand at The Grove. Allergy-friendly options are available, hooray! Trekaroo families have witnessed the glitz and glamour of Hollywood first hand and these hotels have been family approved! The Loews Hollywood Hotel is an iconic property offering the finest accommodations for your family to enjoy. Their premium amenities will help you realize your full Hollywood potential while enjoying kid-friendly perks of the Loews Loves Kids program including a welcome gift, “Kids Closet” items available for use including toys, books, car seats, strollers, potties, DVDs, and more. Located in the Hollywood & Highland complex, adjacent to TCL Chinese Theater and across from the El Capitan and Wax Museum, the location couldn’t be better. The Garland is a piece of heaven in an urban setting. Families will enjoy the heated pool, open lawn, and poolside movies. The location is perfect for Universal Studios – the hotel offers a trolley service that goes to and from the park every 15 minutes. If you are looking for a fun experience for the kids check out one of the family suites – rooms include private sleeping quarters and bunk beds! Don’t miss the American Girl Package at The Orlando Hotel. Hotel guests, and their dolls, are greeted with goody bags, doll beds, and spa robes for both doll and owner. The Orlando is located just a few miles from all of our favorite stops including the American Girl Place and La Brea Tar Pits, just a short drive south of the hubbub of Hollywood. Set in the heart of the city, the Hollywood Hotel offers a fresh and modern hotel with all the wonderful amenities families would expect from the glamour of Tinseltown. From the front entrance, this unassuming hotel could be missed in the crowd, but pull around to the lobby and you will feel like a celebrity, and their concierge services are among the best! 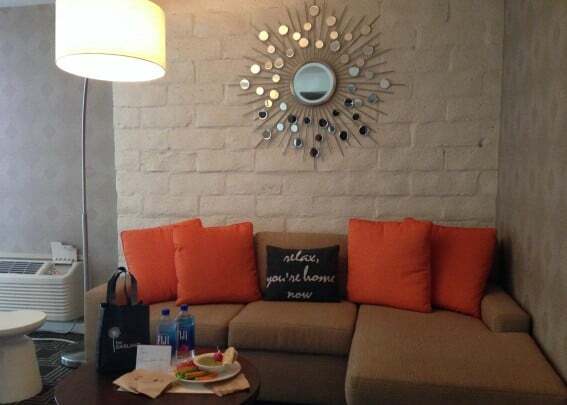 Treat your family to a great getaway at this urban oasis! Looking for even more fun? Check out these 23 epic things to do in Los Angeles with kids.